NetHost is a small hosting company that offers a range of hosting solutions such as web hosting, dedicated servers, VPS, and specialized hosting for WordPress and other programming languages and frameworks. 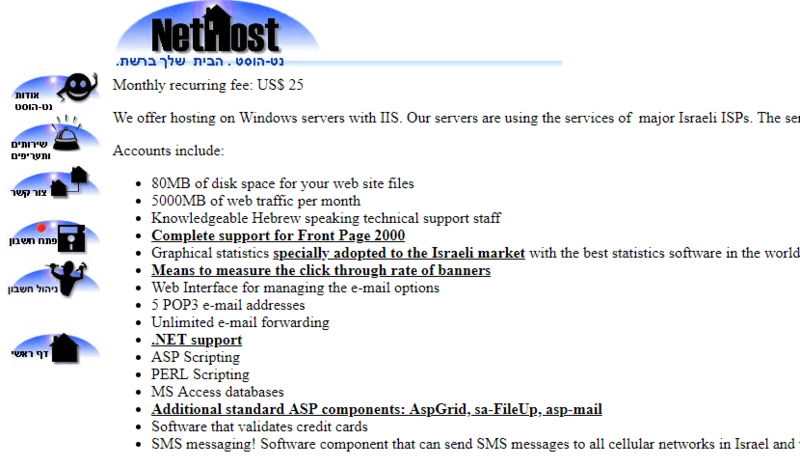 Israel-based NetHost specializes in Linux and Windows web hosting though they also provide VPS and dedicated servers in addition to hosting for PHP/MYSQL, Node.js, Ruby on Rails, and Tomcat. Customers can also register domain names and order add-ons such as Office 365, G Suite setup, online backup services, and CDN. NetHost’s hosting accounts come with a nice set of features that make it easy to manage your website and web resources. Not every day do you find hosting providers who offer premium hosting along with specialized hosting services for “coders and programmers’’. It’s nice to see such a small company offering specialized hosting for various scripting and programming languages such as ASP, .NET, Perl, and PHP including full support for Front Page 2000. The other good thing about NetHost is that they offer WordPress specialized hosting for customers who want to setup CMS websites or blogs. It’s ideal for guys who have little or no coding experience but are familiar with the WordPress environment. NetHost has maintained the same website for the last 18 years. Though it’s available in Hebrew and English, their website needs a makeover as it’s clearly outdated and difficult to navigate. Way back in 2000, they use to have a domain registration form, but it’s no longer there. Their packages and corresponding features are all laid out in one page. If you’d like to place an order, you’ll have to call their customer service to assist you with account setup and payments. I haven’t seen the control panel, but I get this feeling it’s adopted to Hebrew users just like their SQL servers and graphical statistics interface. So you shouldn’t have a problem managing your account, emails, SSL, and your scripts. NetHost shared hosting isn’t cheap. Frankly, I don’t know how they arrived at the pricing for their basic package. I believe you’ll get a better deal with more features than the 80MB disk space, scripting languages, and the 5GB monthly bandwidth that they offer at the entry level Their Pro package isn’t any better as it comes with an additional 40MB disk space, 10GB bandwidth, and SQL server support. It’s disconcerting that they also charge fee to just to set up SQL servers. For reasonable fees, you can obtain additional 1MB of traffic, SSL, dynamic DNS management services, mailing list manager, email to fax, and fax to email services. Customers enjoy full technical support in both Hebrew and English. Friendly and knowledgeable, their customer support team and technicians can resolve a myriad of hosting issues in good time. You can write an email or call them during business hours. I wish they had live chat support. NetHost does a fantastic job of providing its customers with reliable and secure hosting packages backed by a dedicated support team that’s available 24/7.